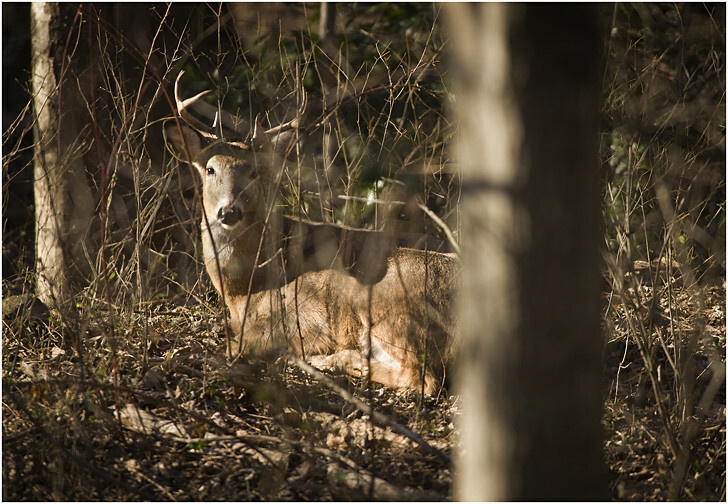 An eight-point whitetail buck rests in the woods near the little Patuxent River in Dorsey Hall. One of the advantages of not having a traditional 9-to-5 job is the ability to take off on a moment's notice for a head-clearing walk in the woods. My favorite path in Howard County is the one that follows the Little Patuxent River in Dorsey Hall. One of the reasons I like it is the very high likelihood that a hiker will come upon at least one deer along the mile or so of path northwest of Columbia road. I walk it nearly every day, and have gotten to the point where I am almost surprised when I do not see a deer. They are regular visitors to our neighborhood, which is nearby. My kids even name the new fawns that show up each summer. And trying to grow hostas in our yard is a fool's errand. A former hunter, I now get much the same thrill out of walking (unarmed) up on deer in the woods and interacting with them. It is fun to experiment with the limits of their perceived zone of safety, and the woodsmanship learned as a hunter is definitely a help. My wife is convinced that they will allow her to come closer if she licks her lips and mimics the motions their mouths make while they are eating -- sort of a secret handshake. I have tried this (when no one is watching) to mixed result. For an excellent chance at seeing deer in Howard County, walk the trail next to the Little Patuxent River in Dorsey Hall from late afternoon to evening. To reach it, follow Columbia Road until you see an orange-topped post on the left-hand side about 1/4 mile north of the village center (map). The trailhead is on the left, directly across from Ram's Horn Row. Park your car on the side of the road and follow the trail into the woods. Walk quietly and look for horizontal lines about waist high. It's an old hunter's trick to spot a well-camouflaged deer, as there are very few naturally occurring horizontal lines in a forest. If you see one deer, there are probably more nearby. They may be bedded down, or even much closer to you than the first deer you spotted. They have an acute sense of smell and great hearing. But their vision is another story altogether, and mostly relies on catching movement. If you stay perfectly still they may well be willing to share their space with you for a few minutes. And if no one else is around, try the chewing and licking thing and let me know what happens. All content ©2010-2018 David Hobby. Please do not use the photos externally without permission.